The annual Bean Counting Day on the North-West University’s (NWU’s) campus in Vanderbijlpark saw students and prospective employers meet up to discuss industry trends, internships and possible employment opportunities. 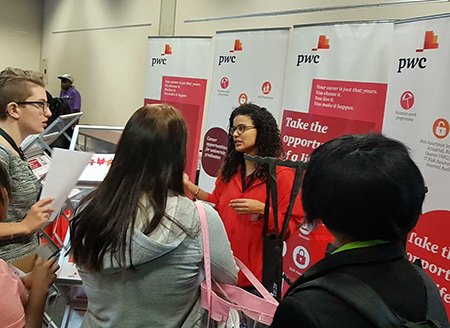 The event – that forms part of the campus’s annual career fair – accorded students within the BCom fields of study and more so those busy with an accounting degree course, with a great way to explore the types of industries and professions that match their skills and interests. This year saw several high-level industry partners hosting exhibitions, namely: RSM South Africa, KPMG Services, Auditor General SA, SAIPA, PWC, Ngubane & Co, OVC, FNB, Standard Bank and Christian Art Distributors. According to Elette van den Berg, campus liaison officer at the NWU Career Centre, a career fair such as Bean Counting Day provides students with a proverbial foot in the door and allows them to make informed choices about possible work opportunities in their field of study. The Career Centre closes gaps between students, employers, alumni and academics. Continuing engagement with stakeholders allows the university to contribute optimally to the development of well-rounded graduates who are able to address the complex challenges of the world of work, but also play a meaningful role in addressing the broad social, economic, environmental and ethical challenges facing South African society. The NWU invest substantially in ensuring relevant curricula that will assist in delivering quality graduates that are able to plough back skills into the economy. By means of various support structures the Career Centre helps student to develop an understanding of the world of work and the kind of attributes that employers are looking for in graduates. Students and prospective employers meet during the annual Bean Counting Day on the NWU’s campus in Vanderbijlpark.